This entry was posted on Monday, August 25th, 2014 at 10:05 pm and is filed under Uncategorized. You can follow any responses to this entry through the RSS 2.0 feed. You can leave a response, or trackback from your own site. Actually, no, they did not “take the ‘important matters’ network name generator and elicit the first 7 people respondents nominated.” As Christopher Ingraham stated in the methodological note at the bottom of the Wonkblog post, they “asked respondents to name UP TO seven people with whom they regularly discussed important matters” [my emphasis]. Only 17% of their respondents actually provided the maximum of seven names. More than a quarter provided one or zero names, and an absolute majority of respondents (58%) provided three or fewer. The average number of “people with whom [respondents] discussed matters important” to them over the previous 6 months was only 3.45. And it turns out that, of these 3.45 core discussion alters, an absolute majority were spouses, partners, or immediate kin. 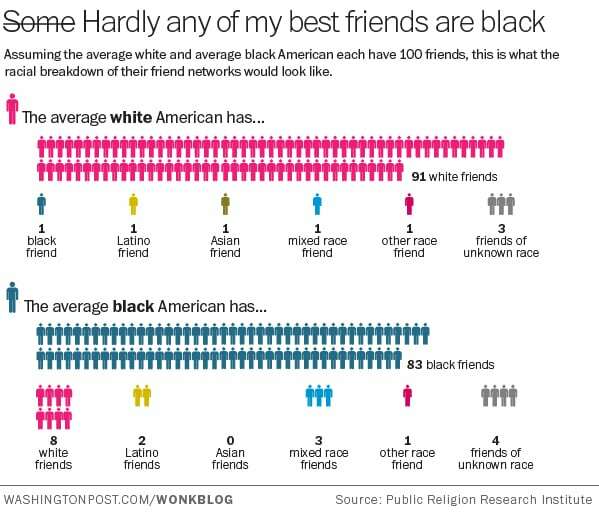 The average number of “friends” per respondent was a mere *1.45*. It’s likely that a substantial percentage of the respondents did not name a single friend in response to the question. The basic punchline is that the PRRI CEO and the Washington Post “data journalist” who “previously worked at the Brookings Institution and the Pew Research Center” are making claims about grapefruit on the basis of an analysis of a grape. It’s not so much that “the method used here is overly simplistic” as that there’s been a stupendous methodology failure, compounded by an epic journalism failure. Retractions and apologies are in order. Sorry. As a person who works in this area, I relied on a shorthand I maybe shouldn’t have. Your note of the “UP TO” usage is completely consistent with the way I read the stories/report, how the “important matters” question is typically deployed, and how my interpretation intended it (if maybe failed to explicitly describe it). I think it can be both methodological flaw AND failure of journalistic interpretation. You’re right that if they elicited names via a different prompt, results almost definitely would have differed. But it’s also true that their scaling up of THIS question has severe flaws in its own right.